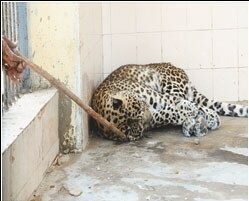 A number of poor animals are suffering and living in miserable conditions at the Landhi -Korangi Zoo which experts believe needs to be closed down forthwith as a facility to house animals because the government has failed to bring about any improvement in the affairs of the zoo which has been functioning in the city for more than two decades. They say that the government which even does not have the expertise and capacity to run the main zoo of the city, must not open such mini-zoos and use animals as a means of revenue generation. Trapping and confining animals in unnatural environment is not only unethical and a blatant violation of wildlife laws, but it also shows apathy of the government. A visit to the zoo shows that the so-called zoo not only lacks environment suitable for animals closer to their natural habitat, but also a proper administration and a solid team of trained staff. The zoo operates under the City District Government Karachi. Currently, the zoo houses a lone lioness, a few nilgais, rhesus monkeys, a pony, a pair of jackals, rabbits, a guinea fowl, peacocks, ducks, geese, tortoises, pigeons, two pairs of silver pheasants, one pair of hens and a few Persian cats. Many cages were empty and all animals were visibly in poor shape. No animal could be spotted in the enclosure for red deer and mouflon while there was only one species in the enclosure for fallow deer. It was surprising to note that different species of animals were kept in same enclosures — a white peacock with a blue peacock and a pony was compelled to live with a nilgai herd. The tortoises, geese, ducks and even pelicans were all in one enclosure that had a small stinking pond. Most of the animals in confinement were without any identification plate. 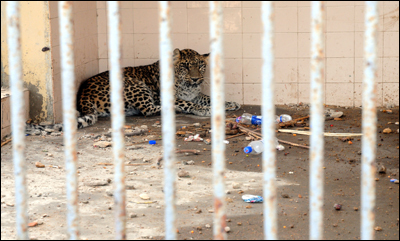 While the cages were littered with garbage, the enclosures were largely barren where a few animals had been kept. No permanent veterinary was posted at the zoo. There had been an obvious decrease in the number of species than last year’s, when the zoo also had a few porcupines, deer and crocodiles. “I have no idea where the animals have gone whether they have died or been sold. A contractor is running the zoo and we just come here for attendance,” said a keeper of the zoo. The zoo-in-charge, who is said to have an experience in “gardening”, was not available for comments. Visitors said that the zoo had been in poor shape for years and seemed to serve no purpose except for a place for dating couples or criminal elements. The poor condition of the zoo and the small number of its collection are major reasons why people are not encouraged to come here. Besides, the zoo has earned a bad reputation which discourages families from visiting here. Wildlife experts, who have seen no improvement in the affairs of the zoo for many years, are of the view that the government must close it down and turn the zoo into an educational park. The animals should be shifted to either Safari Park or the Garden zoo. The government would do well if it makes some investment and turn this zoo into a park to educate children and their parents about nature. The most unfortunate case was, perhaps, of the lone lioness. The emaciated lioness is now so weak that she was even finding it difficult to move. Her condition made one think that she might not live for long. Reportedly, the lioness has lost sight in one eye due to an infection while she was in the Karachi Zoological Garden from where she was shifted to the Landhi – Korangi zoo. The lioness, with a lion, was “given away” by a family in Clifton to the Garden zoo six years ago. At that time, she was said to be six years old. The lion is also passing a life of solitary confinement, but at the Garden Zoo. If one relies on the information available on the Internet, which says that lions live for around 10 to 14 years in the wild and up to over 20 years in captivity, then one can say with confidence that the lack of proper care is the main reason responsible for their poor health. It is equally important to mention here that the Garden Zoo, that also oversees the Landhi-Korangi zoo, has a “tradition” of keeping male and female species of big cats separate. The same, one can say, might have had happened with this pair of lions. Due to an acute lack of expertise in animal care at the government-run zoos in the city, it would not come as a surprise to know that the last time cubs of any big cats were seen in the Garden zoo, which is the main zoo of the metropolis, was in way back in the 1970s. According to senior veterinary surgeons, animals should always be kept in pairs unless there is a health problem with one of them or the female is at an advanced stage of pregnancy and the male can hurt her. In case of a lion, it is all the more important to keep them together since they are highly socialised animals and live in groups in the wild. When animals are kept against their natural way of living, anything can happen. Their health is affected; they would not reproduce and could even die of stress. Or they attack and kill the other animals when come in close contact with them, wild life experts believe. The lack of love for animals of zoos’ officials can also be gauged from the fact that most of the animals at the zoos are unnamed which is against the practice observed in zoos across the world. Jehangir Durrani, a wildlife expert working with the World Wide Fund for Nature, said that the primary function of the zoo was to serve as a gene pool for endangered species and not a revenue generation. The state of animal care at the Garden Zoo is an open secret. When the government finds it difficult to properly care for the major zoo of the city, it has no justification to open mini-zoos solely for the purpose to generate revenue. Every animal, he said, required a certain environment to live in and reproduce and depriving the animal of its natural habitat was a blatant violation of wildlife rules. Pointing out the role the zoos could play in conservation, Dr A.A. Qureishy, a former director of the Garden Zoo, said that a zoo should be self-sufficient in its stocks. Instead of bringing in foreign species, the zoo officials should invest their energies for improving zoos’ stocks. Exchanges of animals between zoos in the country and regional countries is the best way to go forward. But, this stage could only be achieved when care and affection is provided to animals here. Previous Previous post: When Babies Don’t Fit Plan, Question for Zoos Is, Now What?